Wanting to save a little bit of cash on that new air conditioner you’ve been eyeing? Check out some of the coolest (pun intended) AC sales happening this month! Jump right to the AC reviews here! Jump right to the AC sales now! The summertime temperatures are here and, well, we’ve been sweating in our sleep so that could only mean two things. (1) It’s time to buck up and buy our very first air conditioner or (2) it’s time to upgrade our old unit that’s basically been coughing out warm air. The good news is that some of the major retailers are having great sales on a variety of air conditioners, from window units, to easy-to-move portable units, and even a large variety of through-the-wall air conditioners that may cost a bit more but are mighty powerful and, well, permanent. While our friends over at ConsumerReports suggest through their research that August is the best time to buy an air conditioner, we feel like any time you can find a sale is the ‘best’ time. Sure the end of the typical summer season means that retailers are slashing prices since they know their sales will be declining, but what if you want one right now? Who’s waiting all summer to sweat through this next heatwave?! We’ve researched for, literally, hours-into-days to find some of the best prices on a variety of ACs from the brands we love and trust the most like LG, GE, Whirlpool, Frigidaire and more. And we found some pretty cool deals. 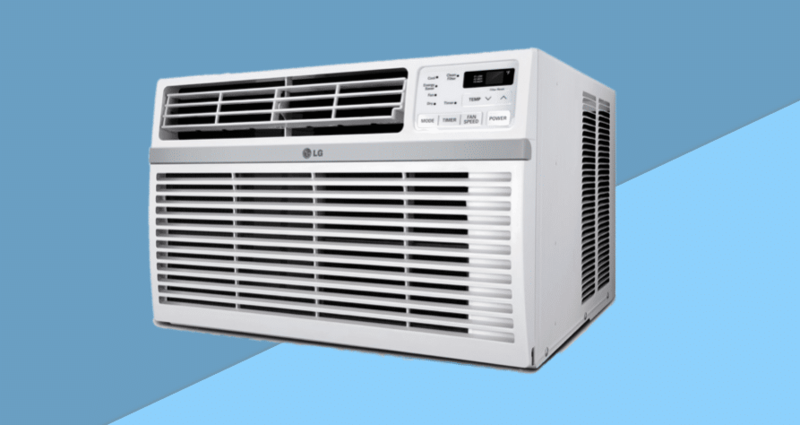 Check out our picks for some of the best air conditioners on sale (so far) in April 2019. This one is not only one of the best sellers on Amazon, but typically named as one of the top rated by other review sites like The Wire Cutter and The Spruce. It has 3 different cooling speeds, a timer you can set so it’ll go on when you want it to and have your room nice and cool by the time you enter, and it even comes with a remote control so you can mess around with it from across the room without ever having to get up. Even better, it currently has over 1,500 customer reviews on Amazon! The above option has 8,000 BTUs, so it’s perfect for small to mid-sized rooms ranging in the 340 sq. foot range. The good news is that they currently have options for 10,000 BTUs, 12,000 BTUs, 15,000 BTUs, and even 18,000 BTUs. See more options here! It’s one of the cheaper versions, but still is great quality with achieving 4.2 out of 5 stars with hundreds of customer reviews (with over 80% of those reviewers giving it 4 & 5 stars). This one is small and quiet (hooray!) so it’s really perfect for a typical sized bedroom, home office, den, or even smaller apartments. We love that it has 7 different temperature settings, has two way air direction to it’ll hit you just where you want (or don’t want) it to and, our favorite part is that it’ll cool down your room in as quick as 15 minutes or less! Learn more here! If you’re looking for an AC unit that’ll be super quiet and, you know, not keep you up at night this is the one for you. It’s ultra quiet and even has a compressor blanket inside that helps reduce the noise even more. For all the sound geeks out there it hit a 44 dBa rating. Not bad! We also love that it his a 24 hour on/off timer you can set, a remote control you can use to control it from a distance, digital display, and 4-way air direction. Another great feature, is that you can use the dehumidify option too which, to be honest, we use more than we’d care to admit. Learn more here! This one currently has been rated 4 out of 5 stars on Amazon and has hundreds of reviews, with over 70% of them giving it at least 4 stars! Outside of this one being compact but still really packing a punch with 10,000 BTUs, our favorite feature is that it has a clean air ionizer to it’ll help allergy sufferers find some relief by reducing pollen and other impurities in the air. Yes, we’d like to sneeze less, thank you very much! It also has 3 different cooling speeds and 3 different fan speeds. Plus, it’ll cool your room down in almost no time at all. Learn more here! If you’re looking for the AC of the future, well, this is it! It’s one of the smartest units on the market right now. It’s already set up with Wi-Fi and you’ll be able to control it from your phone or other smart device once you download the free app. It’s perfect if you’re out and forgot to set the timer and want your rooms nice and cool buy the time you get back. This one is also Alexa compatible, so if you have Alexa you can control the AC with your voice. Why do we feel like The Jetson’s!? We’re also in love with how sleek this one looks. Dare we say it doesn’t really ‘look’ like an air conditioner and more like a bluetooth speaker? Learn more here! This is our runner up for ‘smart’ ACs. You can control it from your app (when downloaded for free) so it’ll work with your smart phone or other smart devices. We’re only calling it our runner up because it’s not voice controlled. It’s still such a great unit though. It has 3 different cooling speeds, 3 different fan speeds, and 4 -way air direction so it’ll either hit you (or not) wherever you pretty much want it to in the room. Learn more here! It's officially that time of year! If your air conditioner conked out or you're buying a new one for the first time, check out this AC sale going on over at The Home Depot. We're seeing some units at up to 25% off the original price. And be sure to click to see if they are still offering that $40-off rebate. Choose from major brands like LG, Frigidaire, Toshiba and more. Stay cool this summer (cooler than you already are). AC Sale: These Air Conditioners are All Currently Under $150! If you're looking to not break the bank when buying your new air conditioner, this just may be the sale price you've been looking for. For a limited time, these window units are all for $150 and less at The Home Depot. Check out some of the best-sellers from brands like LG, GE, Emerson, Whirlpool and more. If you're looking for a killer GE AC, this is the sale for you! This month Jet is offering up to 30% off select GE air conditioners. These range anywhere from 5,000 to 10,000+ BTUs. Check out this awesome sale while the prices are still low and the ACs are still in stock. Oh, and free shipping when you spend over $45. Easy! Keep the savings coming at SamsClub this month! For a limited time you can save up to 20% on select window and portable air conditioner units. Check out their selection of brands like LG, GE, Keystone, Haier, Emerson, Honeywell and more. Plus, many of these are part of the free-shipping sale for "Plus" members. Yes, of course, Walmart sells ACs! And, right now, this month they're having a pretty impressive air conditioner sale where we're seeing prices up to 40% off. Check out their deals on great brands like Haier, Frigidaire, Impecca, and a bunch more. Plus, these are all offering free-shipping! If window ACs aren't for you and you're ready to make the year round commitment of permanently installing your AC, well, then a "through-the-wall" air conditioner is your best but. For a limited time this month you can save up to 20% off these select wall air conditioners for sale at HD. Choose from major brands like GE (best-seller), Keystone, Amana, LG and a variety of other tried-and-true options. Frigidaire is notably one of the best selling AC units in the history of all-things "AC." They are tried and true and are currently on sale at HD. This month we're currently seeing units priced as low as $139! That's a legit steal!